Soak in the sunlight with huge picture windows, two sliding doors, five skylights. Hear the sounds of waves breaking on Long Sands. Stroll 5-6 minutes (¼ mile) to Beacon Street staircase or 6-7 minutes (1/3 mile) to Bathhouse beach ramp. Relax in 920 square feet of single-level living. Cool off with new central A/C from the 18000 BTU mini-split. Enjoy the cottage craftsmanship of yesteryear with custom woodwork, slanted bead board walls, built-in cabinets and unexpected cathedral ceiling. Roam in the large kitchen with over fourteen feet of new countertops, ceramic stovetop, microwave, coffee maker. Dine at the extended table that seats ten. Wash kids in an ample size bathtub or use the inside shower. Splash privately in enclosed outdoor hot/cold shower. Rest under a shade umbrella on the 180 sq ft deck. Barbecue on the 4 burner gas grill. Enjoy the new bedding on 2 queens, 1 full and 2 singles (bunk set). Reserve your place now for this charming family rental. Beth's ancestor's have been coming to York beach since the 1890's, originally building the Vermont House on Broadway in Cape Neddick and later owning property near Barn Point north of Short Sands. Growing up in the Boston area, her family made frequent summer visits to Long Sands and the Golden Rod while visiting family at Kittery Point. Bill grew up near the Pacific Ocean and was introduced by Beth to York before they were married. He had an instant fondness for the coast of Maine and they've been bringing their family every year to Moody Beach, Ogunquit, York Beach and Gerrish Island. With the kids grown, married and living far away, Bill & Beth got the cottage for summer gatherings, hoping to occasionally lure the grandchildren back to the roots of their heritage. In searching for the "right" place, they were taken with the obvious love and craftsmanship of the home's renovations over the years ...and its closeness to Long Sands beach . The craft and quality of the cottage's construction is unique and restful. The abundant sunlight, cathedral ceiling, larger bedrooms, bead board paneled walls, and closeness to the beach are immediate draws. The feeling of seclusion on a knoll shared by two other cottages is quite calming ...and these neighbors are great! 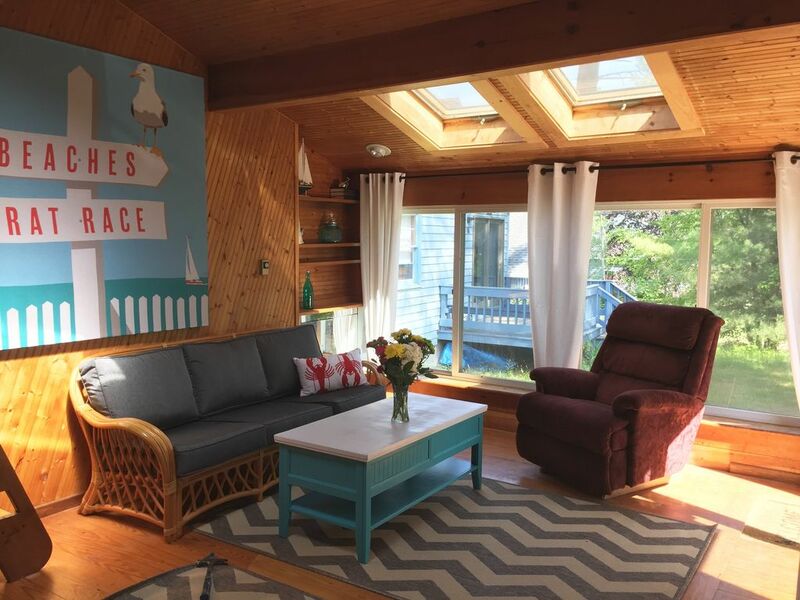 The recent renovations have hopefully brought a tasteful update to the cottage and Bill & Beth are delighted to share their affection for York Beach with their summer guests. With Roku in place for Netflix and other live streaming channels for entertainment. Everything was great! The owners of the property were very accommodating and helpful! Location was amazing and you could hear the waves crashing outside at night. We will definitely consider again if we need to stay in York! Our first stay at this wonderful beach cottage. Very clean and comfortable. The owners greeted us upon arrival. So friendly and helpful. Very responsive to any questions. Cottage has well equipped kitchen, new grill, outdoor shower. The beach is about a 2 block walk, so easily accessible without being right in the middle of the crowd. Long Sands beach is beautiful and its gradual slope to the water plus the little tide pools left by the outgoing tide make it a great place for children of all ages. Many very good restaurants near by. Located in a small neighborhood of other cottages but neighbors were very quiet and respectful of our privacy. I would not hesitate to stay here again and hope to in the near future. Great location with just a short walk to the beach, and it is the best part of the beach as the tide does not come up all the way to the wall in this area. There is a newly built bath house at the entrance to the beach that comes in handy; though a quick walk back to the house is also and option. The home is lovely, perfectly clean and beautifully decorated. Loved the warm water outside shower and the spacious kitchen. The beds were so comfortable; everyone in the family commented on them! Nice deck to enjoy a cookout on the grille provided and a back yard table and chair set is also available. We have only great things to say about this property! Thank you Bill and Beth, hope to be back next year! The best cottage we've rented in years!!!!!! The family and I recently stayed at Bill and Beth's place in York Beach and we couldn't have been happier. They obviously take a lot of pride in making sure you enjoy your stay. The only 2 minor issues were the size of the coffee maker ( it only makes 5 cups at a time and we had 4 serious coffee drinkers) and the shower head on the outside shower should probably be replaced (there was almost no water coming through) otherwise we were extremely happy with everything and look forward to staying again in the future. Thanks !!!!!! This was our second year spending a week at the cottage; arriving felt like coming home. It's the perfect location for fun, especially with young kids. Sunny day? Hit the beach early, then come home for lunch and rest. (Bonus: The new bath house on Long Sands Beach is lovely.) Rainy day? Hit the Fun-O-Rama. Rain clears? Walk to the beach and find a jellyfish with your flashlights. Windy day? Bring your sweatshirts to the beach. Every day? Enjoy the feeling being in a true vacation destination, where folks are friendly and happy to say hi to the kids. Thanks to Bill and Beth for being extremely kind and understanding hosts — we so appreciate it.